Kinver "Over the Edge" is the West Midlands Supreme Champion Beer of 2012 and 2013. "Over the Edge" is a light coloured winter warmer weighing in at 7.5%. The venue is close to Exeter Central or St James Halt rail way stations, and bus routes. You can even fly to Exeter if you wish. 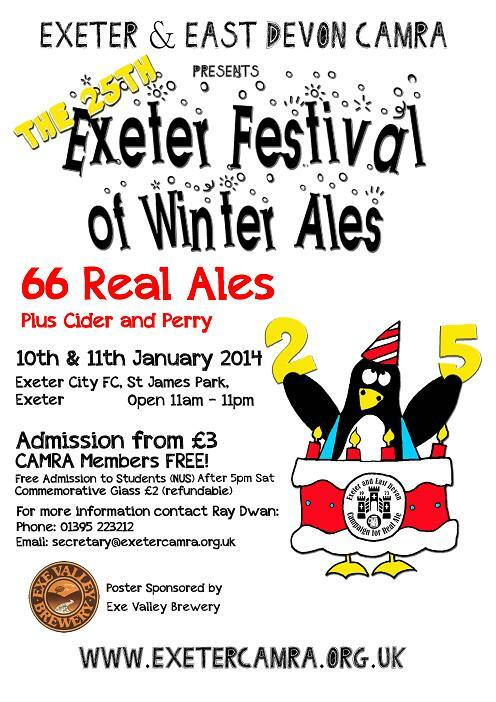 66 winter ales, including Kinver "Over the Edge"
12 real ciders, Ginger Ale. Free soft drinks are available for drivers. The closest parking is probably the Belmont Road Long Stay carpark or the King William Street carpark. Alternatively, take the Park and Ride from Sowton or Marsh Barton. Hot and cold food are available on both days.